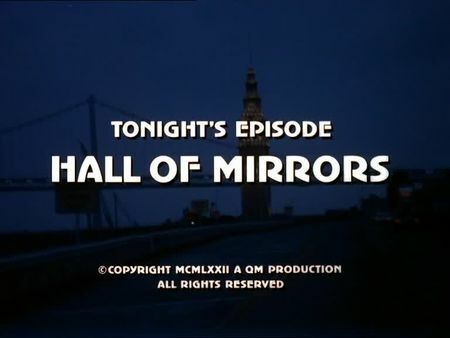 The screencaps for Hall of Mirrors were just added to the episodes section, starring David Soul as Inspector Jim Martin whose mother once changed his original name Jaime Martinez in order to hide her son's Hispanic roots in an effort to find some equality in opportunity. As a result, Martin has become rather impatient and rude, particularly when investigating a crime amongst Hispanic people. While Steve is struggling with Martins aggressive attitude against Mexican suspects and witnesses in their current case, the injured Mike Stone takes a bus to Salinas, visiting Martin's mother, and discovers the truth behind Keller's temporary partner. Knowing about Martin's inner conflict, Stone and Keller can finally help him doing things right. Apart from the murder they have to solve, this episode clearly focusses on social and cultural prejudices. I did not make it under 120 screencaps again, so this number may become the standard for each episode.